Food regulation is a very complex issue , it is because the food industry is a typical asymmetric information industries. Because consumers can not fully grasp the individual information about the quality of food , and some shoddy food companies choose to reap benefits. When some companies do so, and if it does not sync up competitors , will be at a disadvantage in the competition in the market , so companies may produce shoddy products to win market , real businesses actually producing quality products will be eliminated , and this is The so-called "adverse selection " phenomenon. On markets with asymmetric information , this situation will often appear , economics classic " bad money drive out good money" theory say is the truth. When market failure , under normal circumstances, require the government to implement mandatory regulations , forcing companies to provide safe food . Regulatory regime in terms of the system is currently being implemented , the Chinese government regulation of food quality system is nothing less than perfect, means nothing less severe. However , the fact shows that the actual implementation of the results of these systems are not ideal . In fact , research from the public choice school has long been proved , the same as market failure , government regulators may "failure ." On the one hand , because the government can not grasp the comprehensive production information ; Secondly , we often think that the government will achieve the goal of public interest , but that is often not the case , the specific government officials in the regulatory process , for their own self-interest consideration, and the regulators may collude together become the protector of regulators , and even the introduction of measures required by regulators . Meanwhile , there are some third sector itself can not overcome deficiencies led voluntary failure . As a result, there is an urgent need to establish a three to make up for the failure to achieve harmonization of the regulatory framework in order to achieve the best effect of regulation . In recent years , domestic and international food safety incidents continue to occur , causing great anxiety consumer countries in the world have taken various measures , including legislative , administrative, judicial , to ensure the effectiveness of the food safety regulatory system to safeguard the health interests of consumers, food security has become an important part of public safety in various countries of the world . 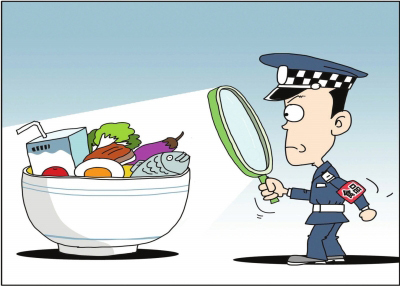 The presence of our current food safety regulatory system problems , so the " four in one" food safety regulatory system for China's food safety supervision is necessary. First, can effectively compensate for food safety supervision in emerging government failure , market failure and voluntary failure. Second, the integration of various resources for food safety supervision. Currently unduly rely on government regulatory process , the power of the other subjects are not able to fully play, while food safety government alone is not enough, a lot of food safety incidents to prove this point . Third, the " four in one" food safety regulatory system not only emphasizes diversification regulation, while more attention to play to their strengths , and concerted efforts to reach consensus . Although he is currently multi-sectoral regulators , but only limited to the relevant administrative departments and quasi- governmental third sector , and rarely agree , when no one wanted to fight for good , if there are problems of shirking responsibility. For example, analysis of Sanlu milk powder incident in front of the state, enterprises and testing departments on mutual shirk responsibility. Fourth, to better safeguard consumer rights , improve government competence and achieve goals and build a harmonious society .